How many times have you seen those enormous street paintings that look entirely different when viewed from the right angle? Have you ever gazed upon a painting to see a large dolphin jumping from out of a pool or an airplane soaring through the clouds? Now, your candlesticks can appear as if they are three dimensional, when in reality, they are nothing more than a 2-D design. By creating something different, these 3-D optical illusion candleholders look absolutely amazing without having to spend a fortune decorating your home. You can play a trick on all of your friends when they look at these intricate optical illusion candlesticks. The designer of these beautiful pieces of art, Chehanowski, has been exploring the relationship between the realm of 2-D and 3-D for quite some time. It wasn’t until Chehanowski wanted to design something that you could hold in a single hand that the optical illusion candlestick came into play. The Flatlight is a magnificent piece of jewelry for the table, which is why so many people enjoy being able to bring this simple piece of artwork into their home. Once you have the chance to look at the piece, you will love trying to figure out just how it all works together. For many people, they don’t understand how one piece could work so intricately to create a layered look to house your candles and light your home. Check out the optical illusion candleholder below and see what you think of this stunning piece. By combining a classic object with a traditional design, the optical illusion candleholder resembles that of a CAD drawing that has been ironed flat with a giant steamroller. When you rest a candle on top of it, the piece looks like an abstract smear of beautiful brass lattice. If you view it head on, the Flatlight will pop out and become an intricate 3-D wired frame. It truly is a piece of art for your dining room table that you have to see to believe. Designing this piece requires a great deal of work into making sure the perspective and angle are perfect. The prototype was produced with laser-cutting tools. 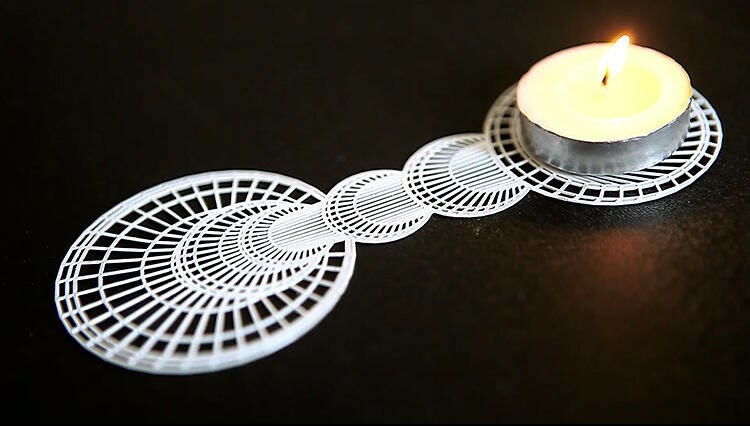 After trying a few times, the accuracy couldn’t be achieved using the laser-cutting tools, so another method had to come into play to make sure everything was perfect. Little details tend to be the most important when it comes to creating an optical illusion candlestick. In the end, the artist was able to produce the piece with photochemical etching, which essentially machines all of the excess material along a thin, brass sheet to the utmost of precision. Even though some might consider this to be nothing more than a gimmick, it is catching the attention of numerous designers around the world. By creating an object that makes someone look twice and actually reach out to touch it, you have effectively achieved your goal as a designer. 3-D art definitely keeps the mind sharp and the viewer on his or her toes. Bringing a smile to the face of others is what it’s all about when it comes to creating 3-D optical illusions. If you can’t get enough of 3-D art, be sure to check out More 3D Pencil Art. The candle is not aligned with the axis of the candlestick – a bit of a giveaway. yes, the angle is a giveaway that something’s amiss.